and respected traditions. Fall in love with its hospitable people. Visit numerous historic monuments that trace the story of this country. If you want to have unforgettable time and to see historically rich cultural treasures of Armenia, you must participate at the fiestas with traditional rituals and ceremonies, which come from archaic times to our days. Do you want listen to the ancient music (V - XV centuries) written in unique notes-khazis, in the oldest churches of the world? And feel the Armenian's soul reflected in the khachkars (cross stones). Enjoy watching the work of the craftsmen and admire their fancy-works. You can attend cookery demonstrations and taste national dishes and bouquet of the wines and cognac. Attend to the marvellous concerts and performances of spiritual, folk, national, classic music and contemporary art in the concert halls, art galleries, museums and open-air fairs. 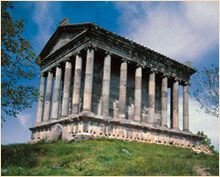 The wealth of Armenia's history, culture and unspoiled nature will be introduced you. So come and experience the perfect harmony of nature, architecture and live culture.